Man eats pizza with dying baby in his arms, video footage reveals. Monday's news in 5 minutes. 1. Mother’s married boyfriend allegedly killed her baby and ate pizza with the boy’s limp body in his arms. A US mother whose 19-month-old son was allegedly killed by her married boyfriend has spoken about the moment she realised her son seriously injured. 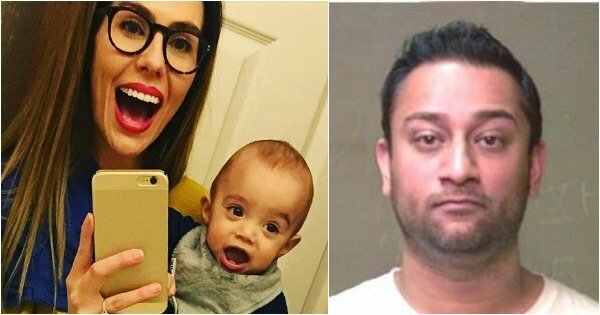 Roxanne Randall’s boyfriend, dentist Bert Franklin – father-of-four who kept his marital status from her – had been taking care of her son, Lincoln, in July last year when he allegedly attacked the toddler. Police said Franklin dropped the boy on his head and kicked him. In the surveillance footage captured at the house, Franklin can be seen with Lincoln’s limp body in his arms while eating a slice of pizza, People magazine reports. Randall was upstairs at the time of the alleged attack and didn’t realise her son had been injured when she put him to bed that night. During an interview with Dr Phil McGraw that airs in the US this week, the Oklahoma woman said she was awoken by sounds of the boy in distress. “I woke up at [2 a.m.] to a sound; I thought Lincoln was coughing,” she told Dr Phil. However, Lincoln was more than just sick. Randall got some medicine for the boy and found him “gurgling” and an ambulance was called. The boy was rushed to hospital where he was pronounced dead, after suffering a fractured skull. Franklin was later charged with murder and is in jail awaiting trial. 2. Hobart woman allegedly attacked, set on fire by boyfriend is responding to sound for the first time. A young Hobart woman whose boyfriend allegedly doused her in accelerant and set her on fire is responding to sound and moving her limbs, her family says. Nicole Evans, 20, was flown to Melbourne in a critical condition early on Tuesday and will require “many months” of treatment. For now, she remains an induced coma in The Alfred hospital with burns to more than 50 per cent of her body, AAP reports. According to her friend, Leslie Chambers, she has improved slightly. “I am pleased to be able to report – having just been speaking with Nicole ‘s mother – that she is responding to sound and moving her limbs,” Chambers wrote on a Go Fund Me page set up for Ms Evans on Sunday. The GoFundMe page had raised almost $22,000 of its $50,000 goal by Sunday night. It’s alleged Matthew John Davey, 34, doused her with an accelerant and set her alight in a backyard shed. He is charged with causing grievous bodily harm and other matters and has been remanded in custody to appear in the Supreme Court of Tasmania on June 13. 3. President Donald Trump has snubbed the annual White House Correspondents’ dinner. Donald Trump has become the first US president to skip the annual media-organisated White House Correspondents’ dinner in 36 years. Without Trump, who scheduled a rally instead to mark his 100th day in office, the usually celebrity-filled soiree hosted by the White House Correspondents’ Association took a more sober turn, even as it pulled in top journalists and Washington insiders. Most of Trump’s administration also skipped the event in solidarity with the president, who has repeatedly accused the press of mistreatment. The president used his campaign-style gathering to again lambaste the media, AAP reports. “I could not possibly be more thrilled than to be more than 100 miles away,” he told a crowd in Harrisburg, Pennsylvania, calling out The New York Times, CNN and MSNBC by name. 4. Adelaide man accused of stabbing murder was “changing his appearance” when arrested. A 26-year-old man charged with the stabbing murder of Alexander Watts was “attempting to change his appearance” when he was arrested, police say. Shaun Falkiner is expected to appear in Elizabeth Magistrates Court by video link on Monday after being arrested on Saturday afternoon at a property in Findon, AAP reports. Police have alleged the stabbing followed an earlier altercation involving a larger group of people all known to each other inside the Elizabeth Shopping Centre. “Subsequent to that altercation, it will be alleged that Mr Falkiner sought to arm himself and then sought out a second confrontation with Mr Watts,” Chief Inspector Shane Addison said. The second confrontation followed just outside the centre with Mr Watts, 25, stabbed once in the chest, police say. Meanwhile, police have uncovered the alleged murder weapon after a tip-off. Insp Addison said the knife was found in a garden bed just opposite the Elizabeth Shopping Centre, where the alleged murder occurred on Thursday night. “That knife has been seized and is currently undergoing forensic testing,” he told reporters. 5. University fees could soon rise by at least 25 per cent. University heads and students will find out what the government has in store for their funding arrangements when they hear from the minister today. Education Minister Simon Birmingham is expected to detail a package that will be included in the May 9 budget that could lead to student fees rising at least 25 per cent, AAP reports. Students might also have to start repaying higher educations loans earlier and a loan fee could be charged at the start of their studies. The government wants to bring the share of fees paid by students closer to half the cost of their degree, up from the 40 per cent average now. Senator Birmingham said recently it was “not unreasonable” to rebalance the proportion of student and taxpayer contributions. “Universities have a vital role to play in Australia but many mums and dads are feeling the pinch of tighter budgets at home and want to know their tax dollars are being used effectively and efficiently,” he said. 6. Two men have been charged over alleged assaults at a Hillsong church in Sydney. Two men have been charged over the alleged assault of two parishioners and a security guard near an inner Sydney Hillsong church. Police say a group of young men were on their way to Redfern station when they got into an argument with a second group about 9.45pm on Friday. They allege the church’s 33-year-old security guard intervened after he saw an 18-year-old struck in the face but was then himself punched in the head. A third man, aged 21, was also assaulted before the second group left the scene. The church has previously said their parishioners were going home after a youth meeting at the Waterloo church. The injured guard was taken to St Vincent’s Hospital with a bleed on the brain and fractured cheekbone where he remains in a stable condition. One man has been charged with one count of assault occasioning actual bodily harm and one of common assault. The other faces two counts of assault occasioning actual bodily harm. One is due in Burwood Local Court on Monday, the other in Downing Centre Local Court on May 22.